Welcome to today's "A Puppy, not a Guppy" book tour stop on Reyjr.com. You can check out the rest of the book tour schedule, where it has been and where it is going next, by clicking this. Irma, our book's main character, is getting some pet fishies. Yes, she's getting some guppies - which I think are beautiful hypnotizing (that tail!). But she doesn't want them - she wants a puppy instead! A puppy, not a guppy! I've always loved fish. Whenever we go to the beach, we always go snorkeling to see some colorful fishes and corals. Fish in aquariums are also a sight - a very relaxing one that adds color and life to any room. Memories of all those hours spent laboriously looking for the right breed on that addictive Fish Tycoon game also come to mind. Hah! The author of this new inspiring and educational children's book is Holly Jahangiri, "a professional writer with over twenty years' experience in technical writing, freelancing, fiction, poetry, and editing." She and her husband J.J. have a daughter, Katie, and a son, William. I like the fact that Holly was born under the sign of the fish too - she's a Pisces like me. Is there a connection in the book? Well, you have read it to find out! Haha! Reading this book to your child as a bedtime story will not only be a wonderful bonding session, you will also be giving them wonderful dreams of guppy possibilities, entice their imagination a little. The second reason I like this story is that it encourages us to look beyond what is at face value, to be patient especially with the disadvantaged, and to not discriminate - lessons anyone at any age should learn. 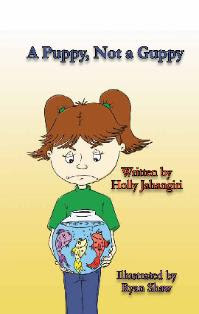 For an awesome chance to win a FREE autographed copy of "A Puppy, Not a Guppy", visit http://jahangiri.us/books/2009/12/contest/. It's so easy to win! btw, you did a very well good job in promoting this awesomeness book! way to go! and more good luck to holly! For the reasons you've mentioned , i would buy one for my child. I know you will! Unlike me - I can't even keep PRETEND fish alive! No kidding, Rey! I can't even maintain pretend fish over at Fishville. I switch to another window to read a blog, and next thing I know, they've all gone belly-up. I have not yet figured out how to help Holly promote this thing yet... but it just occurred to me I do know a librarian. I prefer dogs that can eat anything (hindi pihikan!) and can poop and pee by itself - it'll be a plus if it can bury its own poop no? Hehe! I agree about the fishes though. I wish we had an aquarium at home. My mom doesn't want one because it's a lot of work to maintain it. Hehe. You have something against Pisces, Dave? What, you think we're a little fishy, or something? :) Authors LOVE Librarians - that's a GREAT way to help, Dave! It's okay, Jannie - just glad you made it to the party! Don't worry about the email - catch you next time. But...beware...speaking of parties, you'd better, come the New Year, because with Heather, you, the other Texas Holly and me - it's gonna be like the Bermuda Triangle, and strange things are bound to happen in Texas. And hi Holly. I have an e-mail of yours to answer. Forgive me, I've been inundated with so much awesomeness from so many awesome people lately. And cooking tons and tons of tripe. Not sure there is a counterpart. I think that's the universal word for "small bait fish." Irma says to tell you, "Huwag kumain ng guppies." Very sad. :( Irma's a much better fish keeper.